Scores must be Submitted by: Monday, December 7, 2015 and within 30 days of being shot. Please read the SSAC General Rules, as these apply to all SSAC shoots. Below are the additional rules for this specific shoot. The target is setup like a Tic-Tac-Toe board, where the scoring area is 6" square, with a 1" gap between squares. This shoot is shot at 20 yards for both Adults and Youth. The goal for each end is to shoot a score that matches the number of the end. The first end is for 10 points, followed by 12, 14, 16, 18, and 20. Your actual score is how many points you shoot above or below the intended number. The ends should be shot in order from low to high, alternating un-timed, timed. This shoot has three Un-timed ends the 10, 14, and 18. For each un-timed end you have up to 6 arrows to attempt to match the points. This shoot has three Timed ends the 12, 16, and 20. For each timed end you have up to 30 seconds, unlimited arrows, to attempt to match the points. All arrows touching any part of the scoring area count as that score, even those breaking the line into the gap. Arrows landing completely within the 1" gap count as zero. If your arrows where to add up to 8 or 12, your score for the end is 2. If your arrows add up to 10, a perfect match, your score is zero. If all your arrows miss or land within the lines, your score would be 10. For example on the 10 round: If you shot 3,2,4,1 you matched the 10 exactly (score of 0) plus you met the Bonus rules so your actual score for the end becomes -2. However shooting 3,2,3,2(repeat), 3,2,miss,5(miss), or 3,2,1,2,2(five arrows) would not qualify for the bonus even though they still matched 10 perfectly and would score 0 for the end. 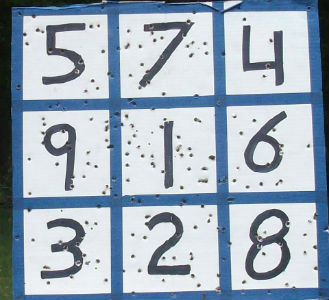 Shooting 3,2,1,5 would also not qualify for the bonus as it does not match perfectly and would score 1 for the end. A *LOW* score is the best score for this shoot!